A very fine Original CORUM 18K. Yellow Gold Watch, SWISS MADE, Automatic Movement. White Dial with Gold Dot Markers. Has a Date Window (at 6 o'clock). Water Resistant. Running Order guaranteed. Case measures 36 mm. (excluding Crown). Original Black Genuine Leather Strap with 18K. Gold Buckle. Comes with Original Warranty Card from 1999. Previously owned. 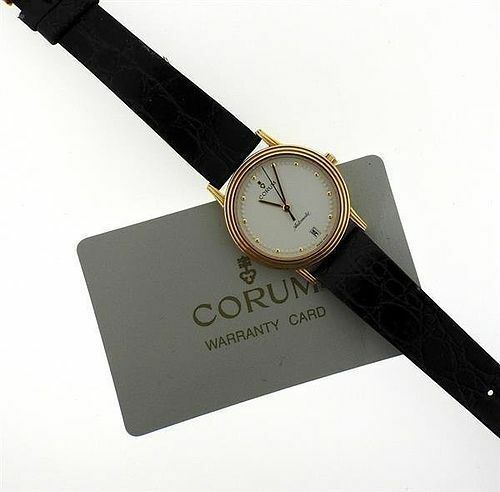 Great condition and hard to find collector's CORUM Watch, Swiss Made. Located in USA. Price includes Free Shipping to US destinations. A superb genuine 18K. 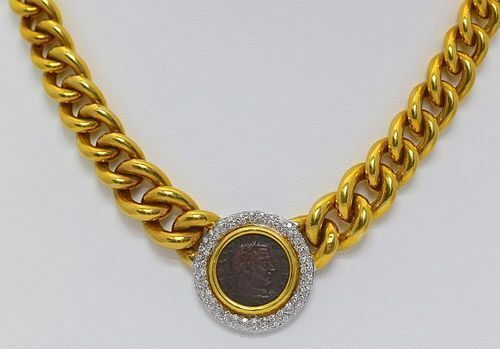 Yellow Gold Italian Necklace with an original/ancient ROMAN COIN and surrounded by a ring of 1.50 ct. (total weight) White Diamonds, Color: GH, Clarity: VS1. In accordance with European Laws the Gold is stamped 750 which is equivalent to 18K. Gold. Total Weight: 63 gr. Graduated Gold Links/Chain. Safety spring Lock. Very Fine Condition! Ships from U.S.A. Length of Necklace 18" (ca. 46 cm.). Free shipping to US destinations.